SAN FRANCISCO — Parallel Play, Kelly Barrie’s first solo exhibition at Gallery Wendi Norris, is inspired by ephemeral free play sites. Originating in Europe in the 1940s, they gained popularity with the social movements of the 1970s, and became catalysts for children’s rights as well as contestations over public space. Since then, non-authoritarian play spaces have largely disappeared. The installation includes work that draws on the Junkyard playgrounds of Barrie’s childhood in London, as well as new work based on archetypal structures from the last remaining adventure playground in the US, which is located in Berkeley, California. In the center of the gallery, “Weed Table,” displays the artist’s studies of “unwanted plants” and detritus. Balanced on trestles and viewed from above, the work suggests that what is expendable in a regulated environment takes on redemptive significance in the free play zone. The installation itself resembles a playground, where viewers maneuver around the objects much like a child at play. 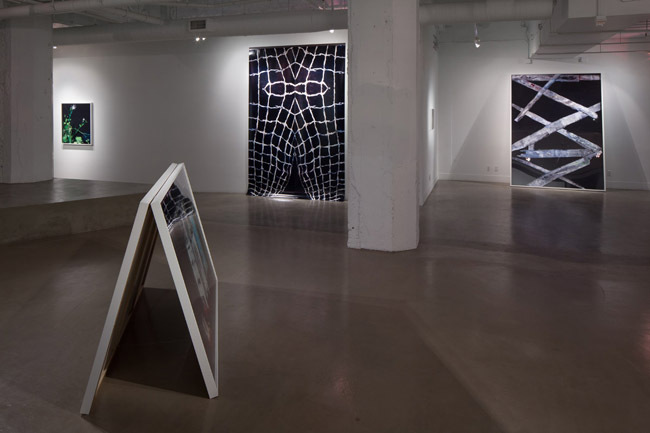 “Double Cross Toe Rope” hangs as a diptych from the top of the wall, allowing the two naked prints to be unrolled like rope ladders until they touch the ground, curling upwards. “Double shelter” uses two framed photographs of a makeshift hut to form a second, three dimensional enclosure. 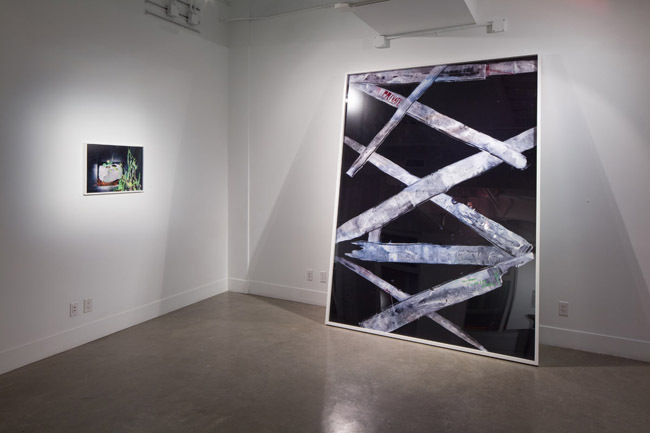 “Plank Ladder” leans against the wall, inviting viewers to trace the surface details of the photograph while negotiating their physical proximity to the work. Performativity is central to Barrie’s working process. Not only in these works, but also in previous projects, which recreate forgotten historical events, he gives a material presence to the act of remembering by literally walking it out of his head. Using his feet and old darkroom utensils, Barrie moves white photo-luminescent pigment powder across black seamless paper on his studio floor. The light sensitive powder drawing is then documented in small sections using a 35mm camera, digitally collaged back together and outputted to scale as a photographic print.